Twins posture stimulates the Small Intestine Meridian, which connects the small intestines with the vital energy channels in the side of the skull and the back of arms. This posture facilitates the inner environment for intestinal relaxation and improves blood circulation in the stomach and brain (3). These effects improve digestion, nutritional absorption, and cognitive function. MBX 6: Twins Posture relaxes intestinal muscles and improves blood circulation in the stomach and brain regions. From natural stance, place your heels outward and bend your knees. 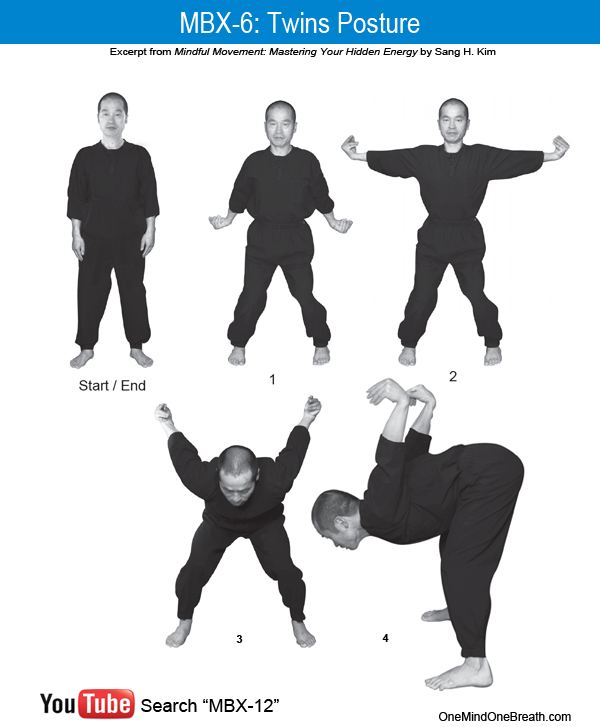 This is the ending position of Peacock posture (MBX-5). Exhale. Inhaling, raise your arms to shoulder height on your sides. Exhaling, slowly bend your body forward and raise your arms backward while rotating your arms inward. Inhaling, straighten your legs. Exhaling, shift your weight to your toes, raising your arms backward vertically and lowering your head as much as you can while looking at the ground. Hold for 5-10 seconds while breathing normally. Slowly raise your body and return to natural stance. Once you’ve bent the torso, straighten your legs and shift your weight forward (4). You will experience increased pressure under the bottoms of the first toes which releases tension in the pelvic floor. Alleviation of tension in the pelvic floor, in turn, helps the intestine relax. You may stay in this posture (4) as long as you want, but be cautious of flooding the head with blood. If you feel uncomfortable or light-headed, gently kneel and go to modified child pose (kneeling with upper body bent forward, arms relaxed and forehead gently resting on the floor). This entry was posted in MBX-12 Workshop, MBX12, Mindful Movement and tagged Chi, Conditioning, Deep Breathing, Digestion, Energy, Equilibrium, Five Points Hand, Invigorate, Ki, MBX-6, Sang H. Kim, Small Intestine Meridian. Bookmark the permalink. I, also, would like to tell you how grateful I am that someone of your background, experience, and enthusiasm would make your teachings available to us, now your new “hometown”. I had to miss the first two sessions due to my mother’s severe illness out of state but found tonight’s session interesting, helpful, and rigorous; maybe fun will come later when I find the postures easier! I was helped somewhat by my study of Tae Kwan Do, unfortunately only beginner’s level and over forty years ago, and tai chi and chi gong. I look forward to next week and appreciate your posting the above information to help us keep the postures in mind. I hope your mom’s health gets better soon. Your practice will get easier, better, and connected in a few more sessions. Your experience in martial arts, tae kwon do, tai chi and chi gong is absolutely valuable in progress in MBX12 practice. Any type of exercise, sport, and physical activity in that matter is helpful, including walking, jogging, swimming, gardening, skating, skiing, gymnastics, baseball, football, fishing, golf, even house and yard cleaning. I post what we learned and practiced in the workshop at MBX12.org a few times a week, so please check it out occasionally. If you have any questions, just drop a note to me. We will not have class on April 22nd, but resume on 29th. Thanks for your comments! Thanks for your response and kind wishes. It is possible that I did not hear that we have no class on April 22 but when I told another attendee she was also surprised. Perhaps there is a way to remind other class members that the next meeting is April 29th. Due to an unexpected family obligation, I have to cancel the class on April 22, but we will have an additional class on June 3rd. Staff members in the department of Human Services will contact everyone either by phone or email. My apologies for the inconvenience.